Ghost in the Shell blasts onto the screen with haunting, Melanesian-esque choral music, post-human spinal tubing and lots and lots of arching breasts. We were kind of terrified in the first few minutes, but eventually settled down to really enjoy this innovative, brilliant, bizarre cyberpunk anime. They say there are no new stories to tell, but surely all that 1980s early Internet sci-fi and Singularity stuff was new! Designing our own evolution for a transhuman future, etc. Because while Ghost in the Shell is talking about ancient Descartesian problems of defining consciousness in a world of epistemological doubt, it's also approaching those 17th-century questions with very 21st-century post-human answers. In particular, in a world of networked computers and biological augmentations, the division between meatspace and cyberspace is blurred. And this redefines everything - as Battlestar Galactica's philosophizing Cylon, Caprica Six, put it: "Are you alive? Prove it." Because, for all you know, you're a machine brain living in a virtual reality. Everyone thinks they're human. Major Motoko Kusanagi (voiced by Atsuko Tanaka), she of the arching breasts which we will be seeing a lot of throughout the film, is a fully cyborg, detective-type badass killing machine (literally). She works for the Japanese government's Section 9, a sort of cyberpunk police squad. Their current target is the criminal hacker, the Puppet Master, who hacks into people's "ghosts" - that is, their consciousnesses, which these days are often embedded in brains permanently connected to the Internet. The Puppet Master's motives are nebulous, and some havoc is wreaked on the garrish, dilapidated, rainy downtown streets. That is, until a rogue cyborg claiming to be housing its own ghost appears. And then everything - especially the definition of life - is thrown into question. But not before we squeeze in some evocative, meditative sequences. Even in moments of crisis, such as during a high-tech/high-speed car chase across nighttime Tokyo, director Mamoru Oshii slows the emotional pace down with somber, spacey music and lingering shots on the details of this very strange, brave new world. Though there are some grisly moments of violence (is this rated R? it should be! ), the tone of the film is more cerebral than action-oriented. Characters often spend their time expositing the themes and ideas. This is excusable as they are running an investigation, and so explaining things to each other makes sense. It's also excusable because those ideas - do you grant human rights to a thinking machine? how did that ghost appear? - are so clever. We really enjoyed it. We liked that, while there is the token human male character (sporting some very 1980s hair and shoulder pads indeed! ), the film is brave enough to keep our focus on the non-human female protagonist, Motoko. Motoko's existential angst is resonant. It feels real (point of the movie, maybe?). When she talks about how being some biomachine superlady with access to infinite bits of data only makes her realize her limitations, we were moved. Oh, Pinocchio! Or as Rudyard Kipling once said , in a quote which has already been pilfered by sci-fi people for post-human themes, "Let them fall, Mowgli. They are only tears." Is this THE cyberpunk movie of all time? Can it be topped?! We don't think so. It's more cyberpunky and smart than the oft-cited Father of the genre, Blade Runner ! Highly recommended. OK, I confess, I didn't quite get 'Bladerunner', so maybe this would be too clever for me?? Banno - Quite the opposite! BR was always way too obfuscating, and thus just a big, muddled, confused mess. GOTS is clear and crisp in its delivery: you can definitely follow along, and the big human/machine dilemmas are more understandable and therefore stimulating. Try ghost in the shell 2.And the stand alone complecx seried.Now you've discovered manga.There are many lost mesa's to be explored. It's been at least five years since I've seen GOTS... but I don't remember having a clue what was going on half the time. Maybe they've done a better job with translation this time around. Bladerunner is one of my favorite films and I like Ghost in the Shell too. 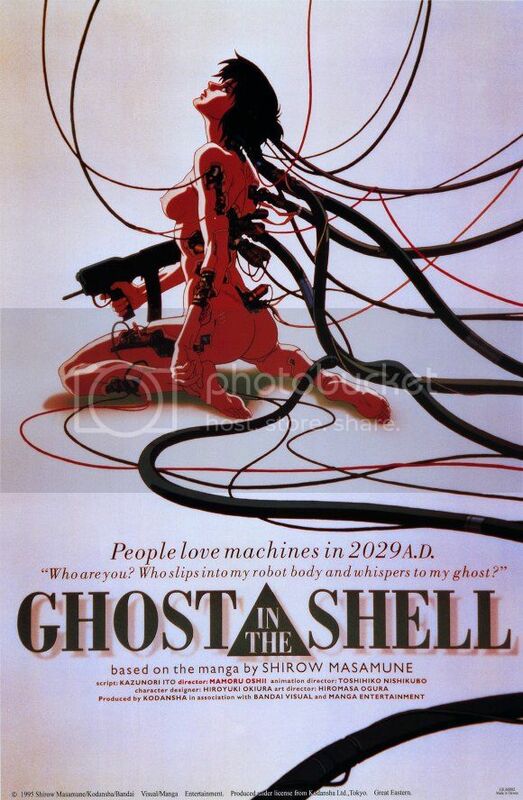 Oddly (I guess), Bladerunner to me was clearer than Ghost in the Shell.